This is a great mattress. We utilize it in our second room for guests. Everyone that has slept on it raves about it. I would definitely recommend. This firm Mattress features Serta's 532 Custom Support Innerspring for excellent body support that also helps to reduce motion transfer from one sleep partner to the other. Plus, a layer of Serta Balanced Support Foam creates that 'just right' combination of cushioning comfort and enhanced support while Serta's Cool TwistGel Foam provides enhanced, breathable comfort. Finally, an extra-thick layer of Serta Support Foam helps gives this Mattress its firm feel. very comfortable i recommend this mattress for the people who like firm mattress. it’s been now few months that we received it and nothing change, still comfortable. 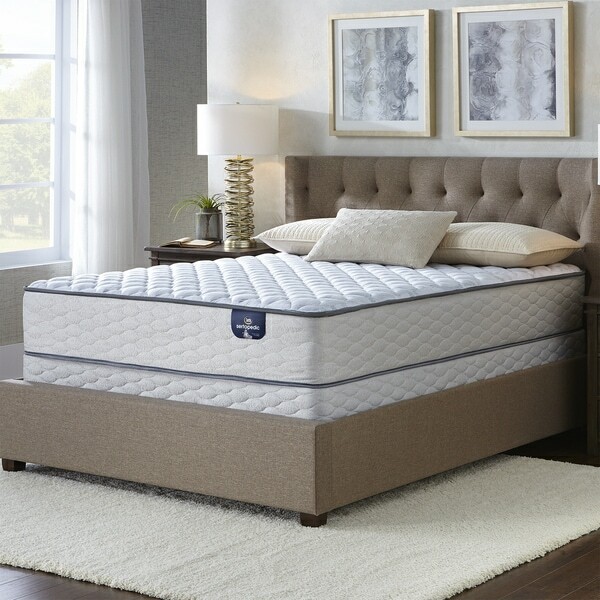 So far I have been extremely happy with my decision to purchase my Serta from Overstock.com I wake up feeling refreshed and without aches and pains. I'm so happy I went with the 10.5 inch Eurotop over another pillowtop. My sheets fit great and look awesome! I had been looking for a mattress for months and was skeptical about buying one online without trying it first. I liked that it had a 30 day money back guarantee. It also has a 10 year warranty.This was just what I was looking for. The mattress is truly firm yet not to hard. I have suffered with back and neck pain for the past two years. I have bought numerous mattress toppers and pads to try to remedy the situation. And absolutely nothing worked. I haven't had any more back and neck pain since I have had the mattress. The delivery wasn't bad. They delivered in about three weeks. The delivery company was very professional and punctual. The mattress arrived without any damage. It had a bit of a chemical smell. But we aired it out for the day. And after that it was just fine. The price was also a huge determining factor in my purchase. I had looked up this same mattress on other sites and they wanted more money. I was able to get a good deal with the holiday coupon. Overall, I am highly satisfied with my purchase. Its okay, not the best, the picture show the mattress look thick, but not, and no I wouldn't recommend this product to a friends. Comfortable so far. Firm as stated. I figured Serta brand would be a good choice. I sleep well and with the support needed. I would buy this product again. This is a very well made mattress. It is very comfortable. The price is unbeatable in our area. I have purchased several mattresses from Overstock. Always pleased with each one! Timely delivery, extremely satisfied. The firmness of the mattress makes for a very comfortable sleep. Fantastic!!! Delivered right to the house! Guys even carried it to the bedroom for us!! Way nicer than expected/A Quality Product. We bought a platform bed too from Uverstock! Perfect Combination for our purpose. We’re snowbirds and spend the Winter in Florida. Bed super comfy. I purchased a topper from Overstock prior to buying the mattress, and it added more softness for us personally although not actually needed. I think that you would be happy with your purchase. I recommend! My sheets fit this mattress perfectly. This mattress is very comfy on my back and my wallet. these mattresses are very comfy and i absolutely love them. i bought 2, one for each room, and my guests love them as well. i always get firm to help my back. do buy these. Excellent mattress. I bought this mattress for my daughter and she absolutely loves it. The mattress is exactly what I was looking for! It was firm and had a nice softness to it at the same time. I have been sleeping well with this mattress. Excellent quality for a great price. We use it in a guest room & get compliments on it from everyone who sleeps in it. Very happy with this purchase. I found this mattress to be very firm but it was too firm for my husband's comfort so I added a "My Pillow" mattress topper and now he seems to be happy, also. I recommend Overstock. I have made several purchases and so have other family members. Great quality. I like the way orders are handled. Tracking is easy. "Is this mattress flippable for rotating I am old school like to flip and rotate mattress every six months"
This is not flippable but can be rotated. "How much does it weigh"
"Do you have box springs"
Reviews. Needed mattress for murphy bed in guest room. "is the boxspring included ??" "is this mattress only or does it come with box spring?" This is the mattress only.